J.A.C.K Chimpanzee Sanctuary » Blog Archive » Thank you again, Robyn! Robyn is a young friend who did some volunteering at J.A.C.K. earlier this year. When leaving, she mentionned she would help and do all her best to raise awareness about J.A.C.K. This is how she managed to collect some funds during a huge rugby match last March. Today, Robyn’s action is different: she has made a banner for J.A.C.K. which is currently to be seen at the AFRICA DOWN UNDER CONFERENCE in Perth. 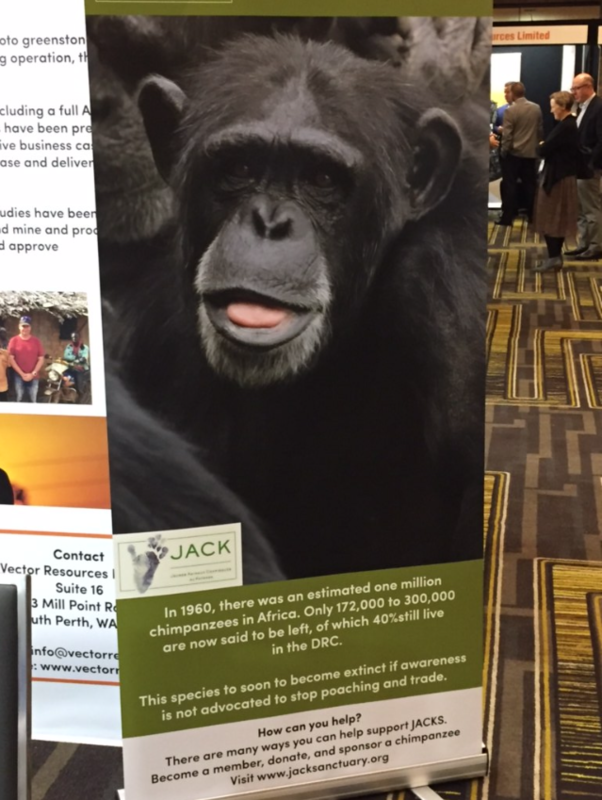 A nice way to promote J.A.C.K.’s conservation work in the DRC, isn’t it? Thank you again, Robyn, and many thanks also to your Dad, Jason, who helps you achieve your goals in developing actions in favour of the hairy residents of J.A.C.K. Your Love and support are really appreciated!! !